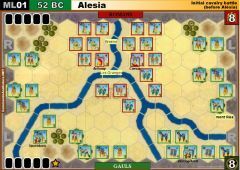 Scenario 5: The same day, Vercingetorix comes out Alesia to support the attack of the army of relief, but it is blocked by the trench (the Great Divide) and cannot act. 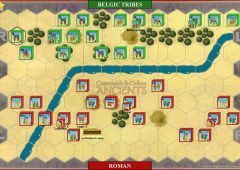 Antoine and Trebonius repel Gallic relief army before Vercingetorix was able to cross the trench. 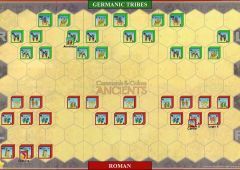 10 000 Roman cavalry and Germanic mercenaries (who have hand in the 2nd cavalry battle in the plain), over 20,000 men defending the fortifications sector, plus about 10,000 men of Antoine and 10,000 other men from the north (in reinforcement). 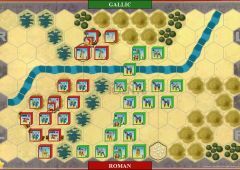 -The Rivers (Oze, Ozerain) are fordable (fordable river). 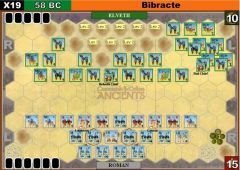 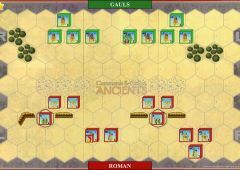 -Each player plays from his board edge (noted Roman or Gallic army). 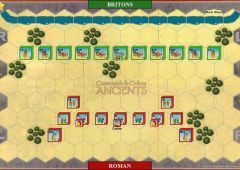 We turn the board so that the edge of a player matches the (lateral) side of the board and not the usual edge (see note left, center, right - (=“gauche, centre, droite”) - on the map for this scenario). 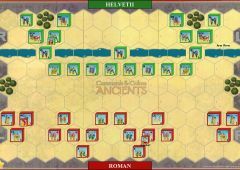 3 left hexes = left, 3 right hexes = right, 3 hexes from the center = center. 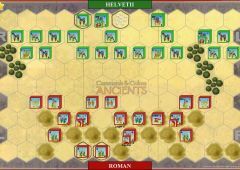 -7 Trench hexes were dug by the Romans (represented by broken ground). 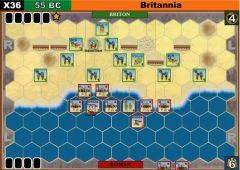 Trench (or Great Divide) Rule : Any unit that enters it must stop and cannot fight this turn (infantry or cavalry). 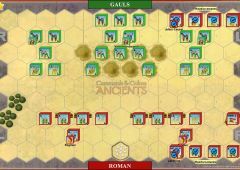 War machines cannot enter. 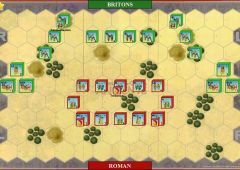 A unit in a trench fights with a maximum of 2 dice (while a unit attacking someone placed in a trench fights with the normal number of dice). 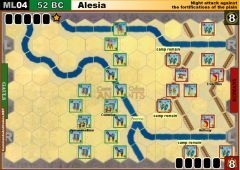 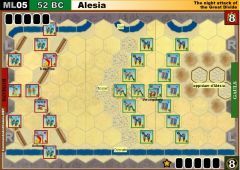 -“Campaign mod”: play the 6 scenarios in succession and note the banners to see who wins the "campaign" (of the battle of Alésia). 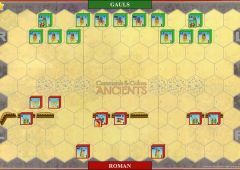 Add up all the banners for all (6) scenarios for this. 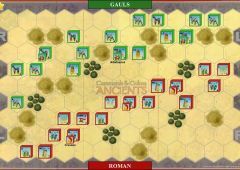 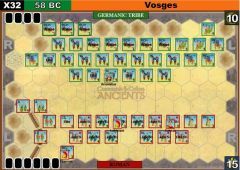 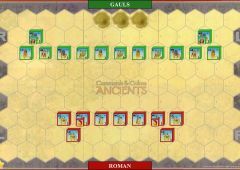 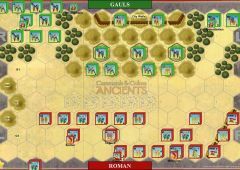 - Replace the Carthaginians by a Gallic army (green blocks, barbarians). 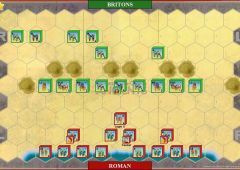 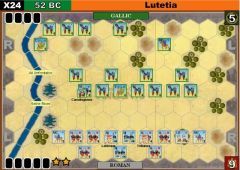 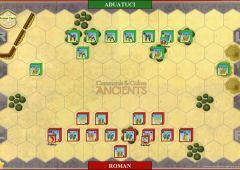 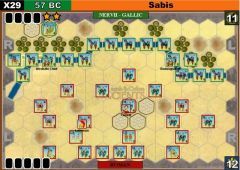 -Game option (free positioning): The Roman player can either deploys his troops so defined by the script, either freely deploys his troops (obligation : within 2 fortification lines). 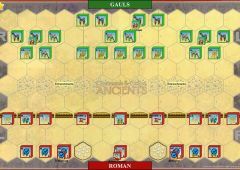 Similarly the Gallic player may deploys his troops freely (obligation, but only on the boxes to the right of the Great Divide (the oppidum side).